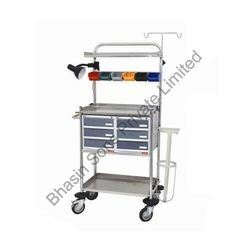 Pioneers in the industry, we offer trauma care crash cart from India. Having well-organized infrastructure facilities, we are able to offer Trauma care Crash Cart. We use advanced technology and research modules for the process of manufacturing these carts. Our products are well-known for its quality and effectiveness. It finds its application in wide range at multi specialty hospital. This product is designed in such a way that they are brought to the patients directly to their respective wards. Looking for Crash Cart ?